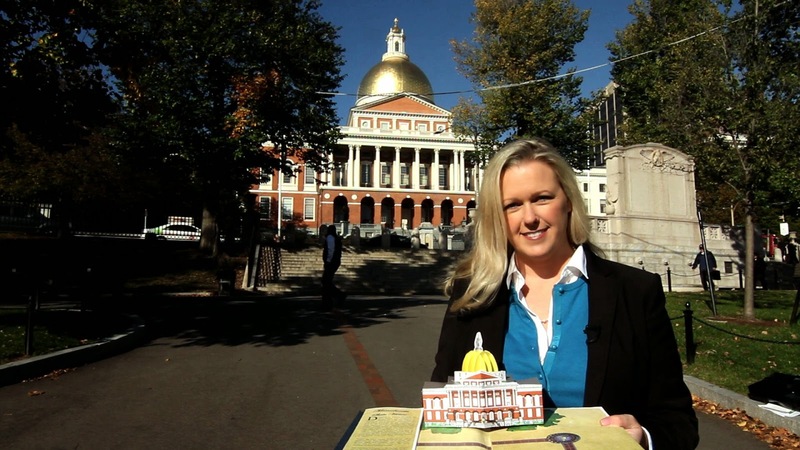 Boston’s Freedom Trail: Making History Pop Off the Page ~ The History Girl! Denise Price with her book at the Massachusetts State House. The Freedom Trail® is a 2.5 mile footpath running through Boston, Massachusetts. The trail highlights 16 nationally significant historic sites that tell the story of Boston's role in the American Revolution. It includes sites like Old North Church (ever famous for hosting the two lanterns that spurred Paul Revere on his midnight ride), Bunker Hill Monument, Granary Burying Ground (where you'll find such illustrious figures as Samuel Adams and the five victims the Boston Massacre), and Faneuil Hall. The trail, demarcated by a red trail line (sometimes painted and sometimes inlaid in brick on walkways), now attracts more than 4 million visitors annually. Almost 5 years ago I was one of those visitors. During my guided tour it became clear to me that there is no better place in the United States to take in the vibrant history of the American Revolution than in Boston. I was captivated. I knew I needed something special to take home to share the beauty of the trail with my family in Denver. So, I began searching for a pop-up book. But I never found such a book on my trip, and I left Boston disappointed. But, I didn’t give up my quest to find a Boston pop-up! After a lot of online research I found there were NO pop-up books about Boston (except Fenway Park) at all. When I moved to neighboring Cambridge, Massachusetts later that year, I decided to create the first one. And what better way to share the city than to share the story of The Freedom Trail? During my many hours at each site examining architectural detail, talking to staff, volunteer guides, and other trail scholars I made many wonderful “behind-the-scenes” discoveries. A few highlights are: the views of Boston Common from atop Park Street Church (where you’ll see me in my Kickstarter video), the mechanical workings of the historic clock on the Old South Meeting House, the one ton Paul Revere Bell of King’s Chapel and the crypt at Old North Church. But my most favorite were the five historic weathervanes along the trail. There is the Park St. Church weathervane, which often gets overlooked completely. However, it is historic and dates to around within 50 years of the church’s construction. Its stylized scrolls symbolically represent song and the wind, which makes it perfect to top the church just 217 feet from the ground. The Sunburst serves as its tail and a five pointed star, pointing to the heavens, tops the weathervane. The history of this weathervane has been lost, however I have been invited by the church to dive into their archives to perhaps unearth some lost history. Then there is the amazing weathervane of the Old State House. It is quite large at 5 feet high. The maker is unknown but it is beautiful and functional and has recently been restored. It is in the long johns design most common in England and most appropriate for the time of the building. Of course, almost everyone knows about the grasshopper that tops Faneuil Hall. Shem Drowne, who also made the weathervane atop the Old North Church, was made it in 1742. (Shem Also constructed the rooster that tops First Church in Cambridge, which is still there today!) It is gilded copper and has a beautiful glass eye. And everyone knows the famous story during the War of 1812 that anyone of the time who didn't know the answer to the question "What is on the top of Faneuil Hall?" would most probably be under suspicion. Old North Church has a weathervane that has stood the test of three hurricanes, it has stayed on the top of the steeples that were destroyed in 1804 and 1954, and was recently restored after Hurricane Sandy. Charmingly, the weathervane has graced the top of the chapel since Paul Revere rang the church bells as a bellboy. My, the history that weathervane has seen! And lastly, there’s the weathervane at Old South Meeting House. This split banner style weathervane was cleaned in 1879 and a note inside said, "made by Thomas and David Drowne, Anno Domino 1730." These were the sons of Shem, who created the Old North Church and Faneuil Hall weathervanes. Though it was designed similarly to weathervanes found on Christopher Wren style churches in England, it was still appropriate for a Puritan meetinghouse because it lacks religious symbolism. It still works for today's uses of the building as a historical and cultural venue. 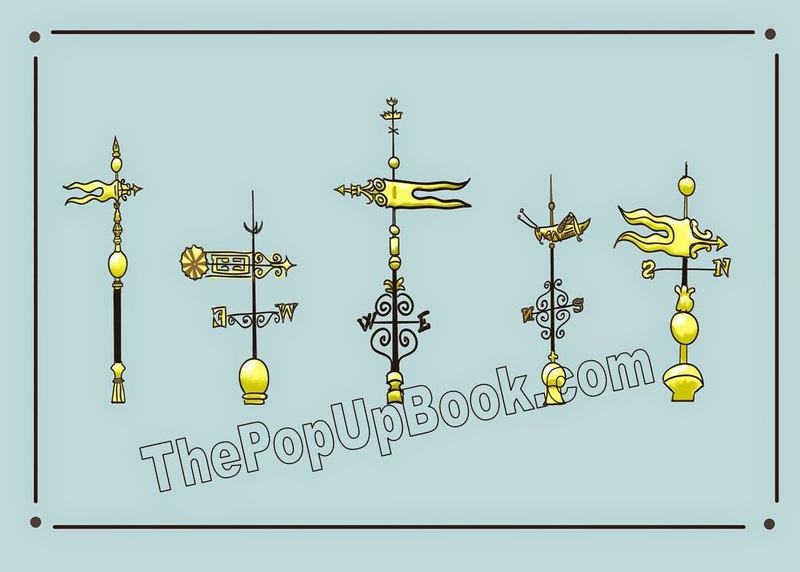 These weathervanes were so charming to me, that I thought it was important to honor them with their own individual illustrations and histories in The Freedom Trail Pop Up Book. The limited edition giclee print I’m giving away as part of this blog post features all five! Five Historic Weathervanes of Boston, Massachusetts. After all the research was complete, the paper-engineering and illustrating began. With notes, photos, and a love of the trail to guide me, I began the painstaking work of cutting, folding, pasting, drawing, and writing. The finished book includes 16 architecturally and historically accurate pop-ups as well has hand drawn illustrations and a succinct written history of the trail and its landmarks. After three years of work, editing, fixing, and paper-cuts the book was finished in 2013. I’m working now, to self-publish and produce a limited run of 5,000 books. I hope they’ll be used in homes, libraries, classrooms, and book collections from coast to coast. A portion of the proceeds will be donated to The Freedom Trail Scholars Program, a non-profit dedicated to bringing interactive history education into greater-Boston area classrooms. The book is now available for pre-order ($45) on Kickstarter.com where you’ll find more information on the book and other fantastic Freedom Trail rewards (including private and behind the scenes tours). For years pop up books have been my souvenir of choice. More than a t-shirt or a mug that simply says ‘I’ve been here,” a pop-up book is a way to share and relive the experience any time. Pop ups capture architecture, art, history, and culture in a way that no other printed material can, 3-D! They are educational as well as sentimental and so fun to share. With the rising production costs around the world, it is likely that pop-up books will cease to be made in the near future. 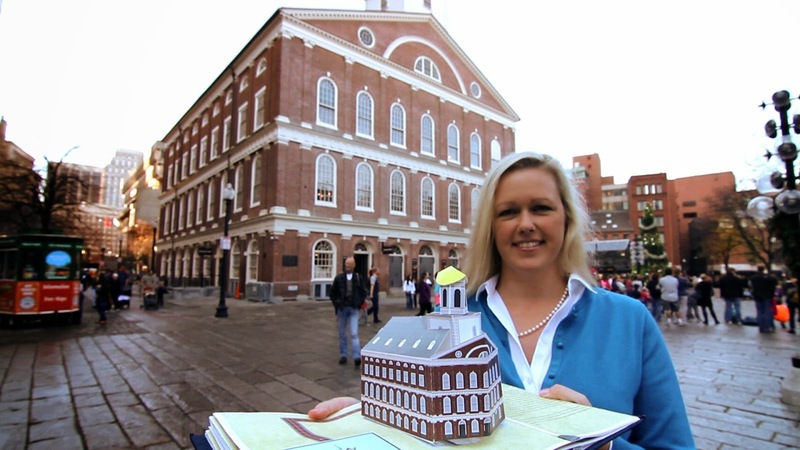 Denise Price with her pop-up book mock-up at Faneuil Hall. If I am funded, I will be able to obtain the final color dummy book from the assembly house. After any edits are completed, the book will go to press. Once printed, the book will be hand assembled, piece by piece, and glued together. When the inside is complete, it will be mounted into the hard cover binding, boxed, and shipped to Boston, where, with the help of The Freedom Trail® Foundation, The Freedom Trail® Pop Up book will be available to the public. 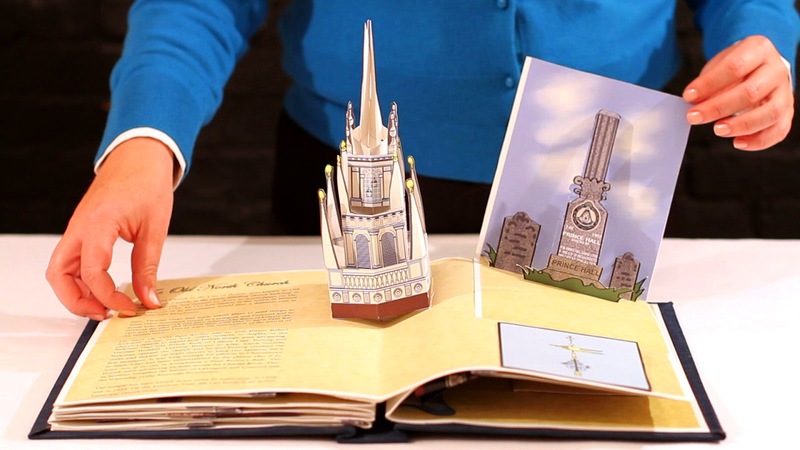 You can click here to pledge now and pre-order your own copy of The Freedom Trail Pop Up Book. Having seen twenty countries on five continents Denise has a certified case of wanderlust. Inspiring a love of history, architecture, and world culture, her travels have been a major influence on how she views the world, reacts, interacts, designs and breathes. Denise was introduced to the paper arts over twenty years ago at a summer arts intensive. And her passion for the paper was stoked and has burned ever since. Holding an MBA in International Business, she combines her astuteness for business and her eye for detail to create marketable and interesting art.